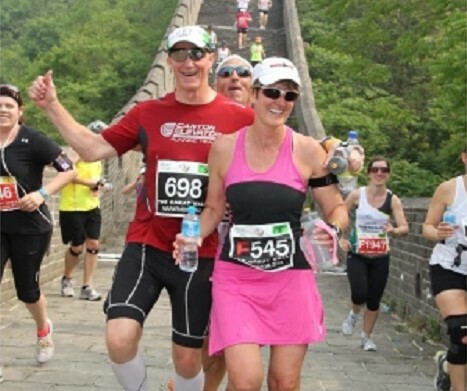 Notice: Register for the 2015 Great Wall Marathon now! 2015 Great Wall Marathon will take place on May 16th. Chairman Mao once remarked, "He who has not climbed the Great Wall is not a hero." While now, never he could imagine that more than 1,600 athletes from 50 countries not only climbed but ran The Great Wall of China Marathon! This amazing event is held annually in Huangyaguan (Yellow Cliff Pass) Great Wall ,Tianjin, a rural province three hours outside Beijing. 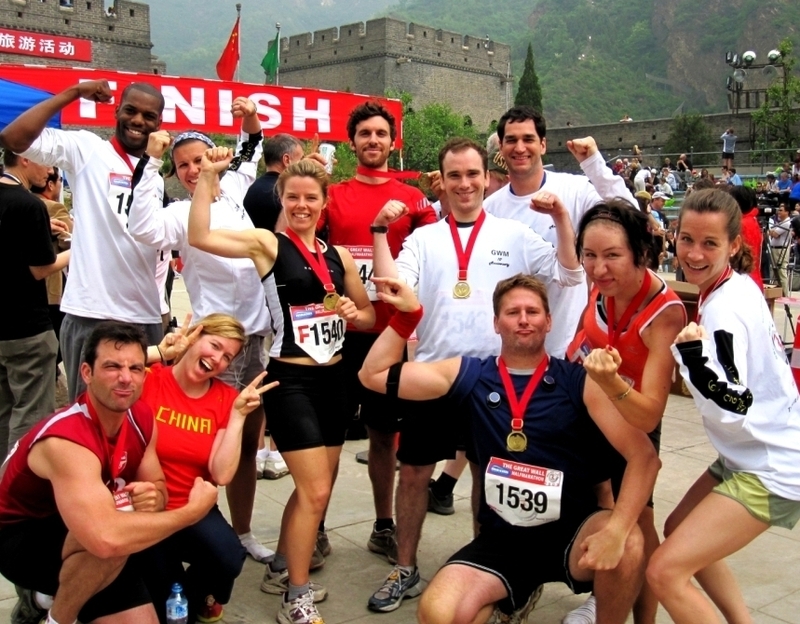 Great Wall Marathon, sponsored by a Danish company, is revered as one of the most challenging marathons in the world. It is regularly held on the third Saturday of May of every year. Runners clambered over thousands of steps, varying in length and size, to complete the course. Along the course pass through beautiful farmland and tiny, picturesque villages. Do not let the challenging course intimidate you. 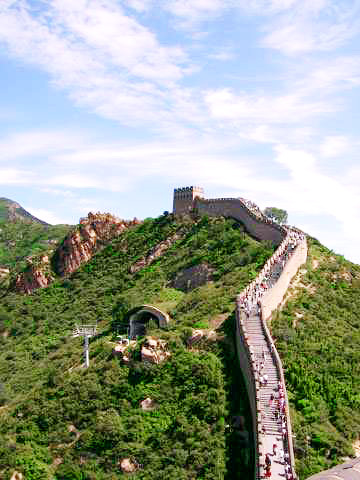 The Great Wall offers and event for everyone and many of our travelers choose one of the shorter distances. Most runners/walkers carry a camera to capture the experience of a lifetime. 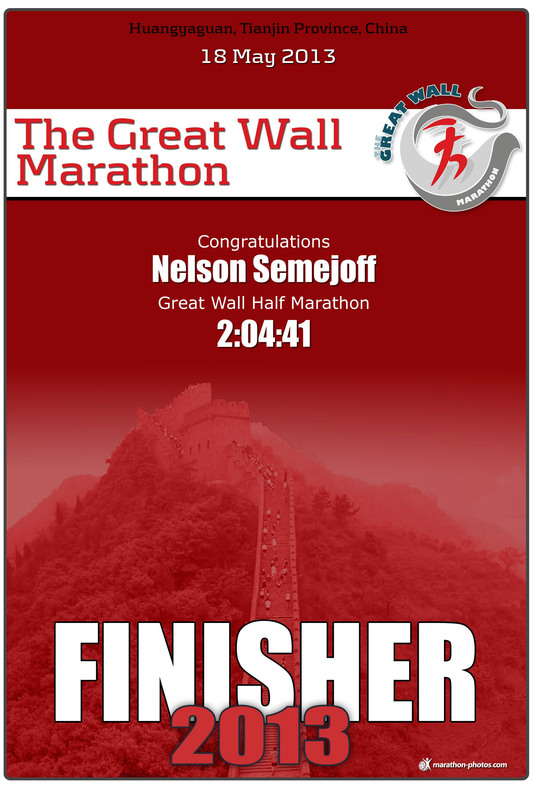 Our customer - Nelson Semejoff - had a good performance in 2013 Great Wall Half Marathon. Here is to share his certificate with you (click the picture to zoom). And Good Luck to your Great Wall Marathon ! The course is awesome with 8K on the Great Wall. Participants can take part in full marathon, half marathon, 8.5km Fun Run . 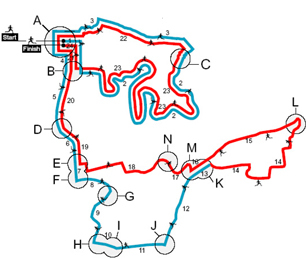 Physically, The Great Wall Marathon course can be divided into two sections. The first section which covers approximately 9 kilometres takes the runners up to, across and down the Great Wall of China. This part of the course is marked by steep ascents and descents of up to 10% and consists of thousands of steps. Runners are advised to run slowly going up and down the mountain, as well as to walk when passing the steepest parts of the Great Wall. Full marathoners will complete this section of the course twice, whereas half marathoners will only pass it once. The second section of the course, which takes the runners through picturesque villages and rice fields, is done on flat asphalt and gravel roads. All roads are in good condition and do not require special footwear. Full marathoners should be aware for a long ascent when going towards the turning point (letter L on the course map). This ascent may seem easy compared to the road leading to the Great Wall section, but after running approximately 21 kilometres it may come as an unpleasant surprise. Kindly check detailed Great Wall Marathon Map (PDF) and Race Profile (XLS) for routes of Full Marathon, Half Marathon, 10K and 5K. ChinaTourGuide.com wishes you note that this event is spectator friendly, you don't have to participate in the runs to travel with our tour. Non-participants will have the opportunity to experience The Great Wall at Huangyuaguan on inspection day two days before the actual event. Transportation is available for spectators on event day to various sections of the course to view the runners. So tell your neighbors and family members about this incredible, awesome travel experience. 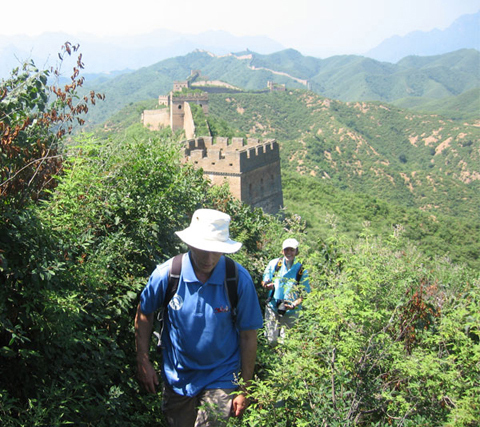 For more detailed Race Information about 2015 Great Wall Marathon, you can directly contact our trip advisor! 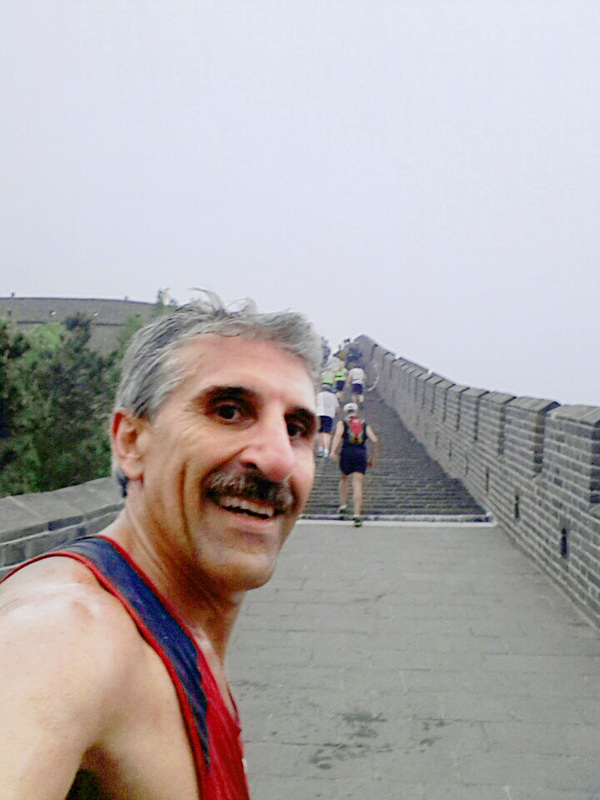 Great Wall Marathon course is awesome with 8K on the Huangyaguan Great Wall, Tianjian, near Beijing, China. 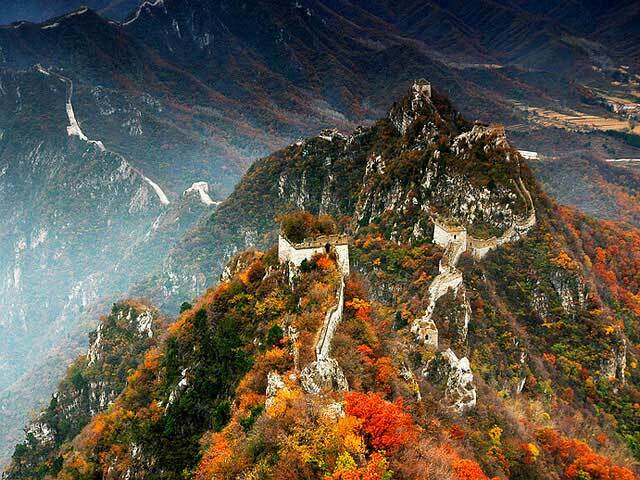 The Huangyaguan (Yellow Cliff Pass) Great Wall is situated in the mountainous area of Ji County in Tianjin City, which is 130 km east of Beijing. Originally constructed in the Northen Qi Dynasty (550-557) and it was repaired by General Qi Jiguang in the Ming Dynasty (1368-1644). 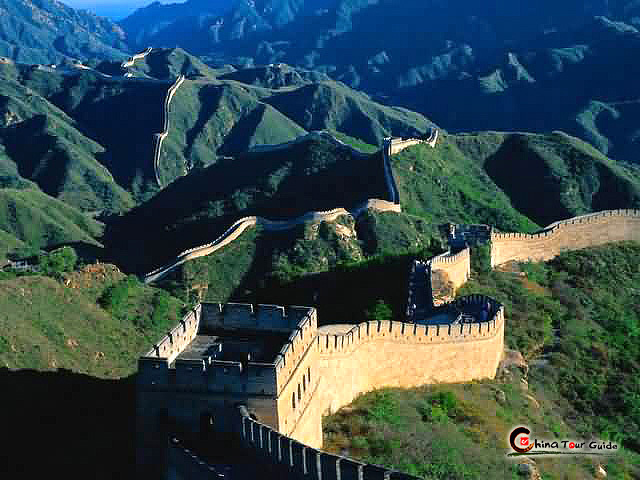 The Huangyaguan Great Wall connects the Malanguan Pass in the east in Hebei Province and the General Pass in the east in Beijing City with a total length of 42 kilometers, and 52 watch towers and 14 beacon towers were built along this section. The rock and cliff to the east of the pass are always yellowish at the dusk, hence its name. This section of the wall was restored again between 1984-1986, and opened to the public in 1987. There are 20 watch towers being restored with total length of 3 kilometers. Strong: With its walls and towers built on mountain ridge with an average altitude of 738 meters, the Huangyaguan is really overwhelming. To the east there is the cliff, and the west, crags. It winds its way across mountains like a dragon. Guarding a stronghold, it has been the north entrance of Ji County. Steep: On the mountains with peaks rising one higher than another, the wall jumps its way up and down as a linkage between the cliff and crags. Since the mountain is sloppy, the steps are very high. In some sections, it looks like that the wall is running straight up or down. When you look down, you will feel dizzy at the sight. Ancient: With a history of over 1400 years, the ancient wall was reserved well until today. 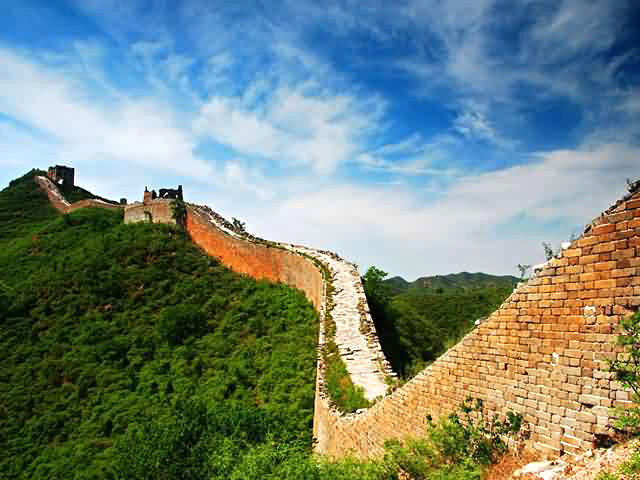 In Ming Dynasty, it was added with walls made of bricks. 1. 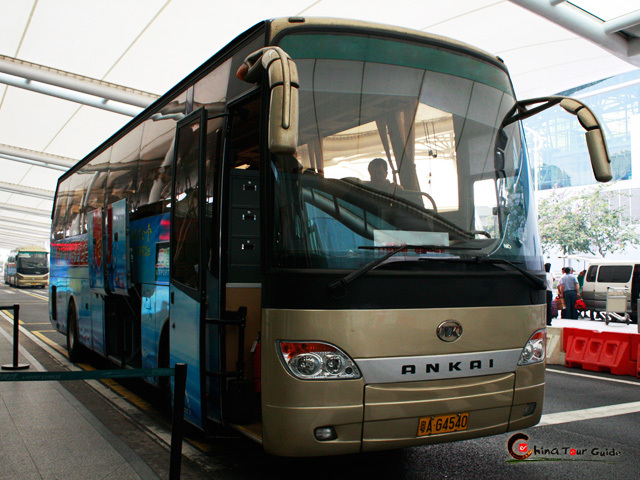 Start from Tianjin: You can take a bus to Jixian County in Tianjin Hebei Bus Station. The bus runs from 06:30 to 18:30. Between 06:30 and 12:30, it runs every eleven minutes, and between 12:30 and 18:30, it runs every six minutes. The bus ticket costs CNY 25 per person, and it takes about 2 or 2.5 hours from Tianjin Hebei Bus Station to Jixian County. When arrive in Jixian County, you can take a taxi to Huangyaguan Great Wall. It costs about CNY 50 and takes about one hour to the wall. Or take a tricycle from Jixian Passenger Station to Gulou Xikou (also Xiguan) which costs CNY 3 to CNY 4. In Gulou Xikou, there are many minibuses to Huangyaguan Great Wall. The bus can hold seven to eight people and costs about five to ten yuan (You can bargain over the price). The bus goes when it is full. 2. 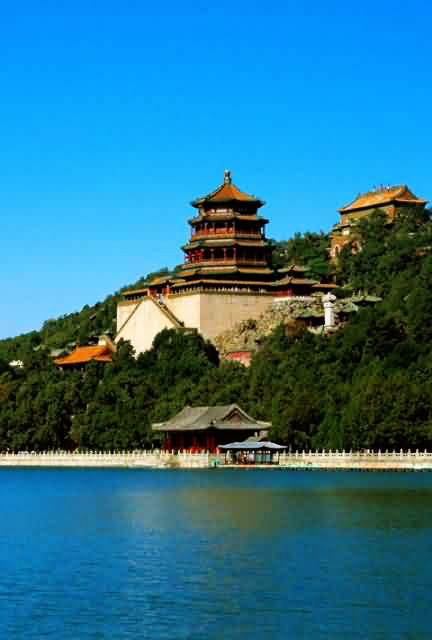 Start from Beijing: Take a bus from Sihui Long Distance Bus Station to Jixian County. The bus runs every ten minutes between 06:30 to 19:30. 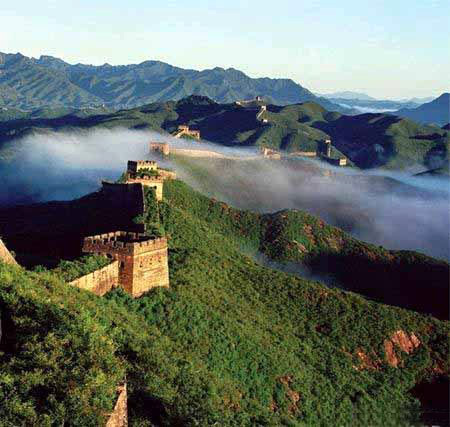 When arrive in Jixian County, you can take a taxi or a minibus to Huangyaguan Pass of Great Wall (Refer to the above detailed information "Start from Tianjin"). 3. A taxi from hotel in Beijing will cost CNY 800 for a whole day trip. 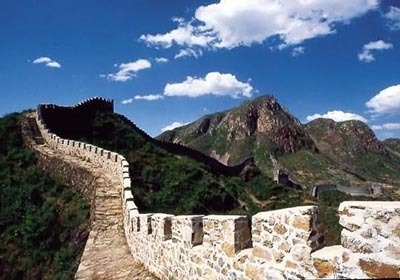 ChinaTourGuide.com will provide your group comfortable vehicles to Huangyaguan Great Wall once you booked our tour packages. The minimum requirement to obtain an entry into this great event is to take our tour package. Race Runs: Full, Half, 8.5k. Great Wall Marathon Inspection Day: May 14th of 2015. Step 4: Make good preparation for your tour. The Great Wall Marathon 6-day package features an amazing tour of Beijing and a stay in rural Jixian to explore a different side of China. Take part in one of the world's most challenging marathons, and challenge yourself in a great holiday, 13-18 May 2015. Whether you are the Great Wall marathon runner or friends or family of the runners, this tour is aimed at making your China tour wonderful. 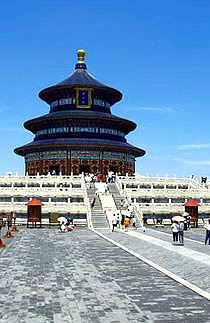 It offers great opportunities to explore the cosmopolitan hub of Beijing. Combine one of the world's most challenging marathons with a great holiday, 12-18 May 2015! If you want to make changes or add other attractions or cities (like Terra-cotta warriors, Tibet, etc) to your tour, please click the below banner to tailor make your UNIQUE tour! 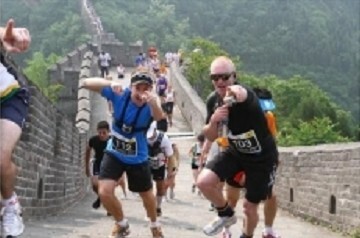 ChinaTourGuide.com aims to provide the most wonderful traveling experience for your Great Wall Marathon Tour! 1. You are highly suggested to make full preparation for your Marathon tour, pack anything that you need! 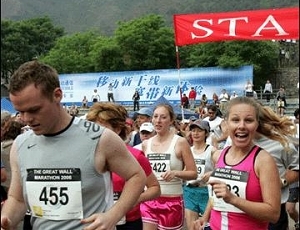 The Great Wall marathon typically takes runners 50 percent longer to complete than their average marathon. Along with the high temperatures you can expect, make this marathon or half marathon a true test - most marathoners expect to be over 1 hour slower than their road times. This is a race for everyone, there are no time limits and the course remains open with full back up support until the last runners' finish. 2. Especially for Marathon Runners, during our trip, in spite of the insurance included in Tour Package, we hope you pay full attention to your body condition, we don't want you confront any accident to lost the opportunity for Marathon. 3. 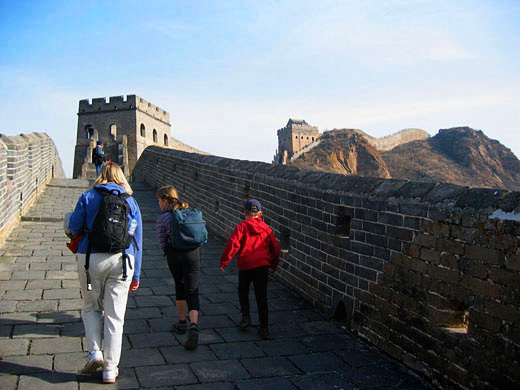 The route on the incredible Wall and the remainder through beautiful mountain villages and along magnificent country trails, you will see lots of poor Chinese village boys and girls, if possible, kindly bring some candies to those innocent and curious kids. 4. 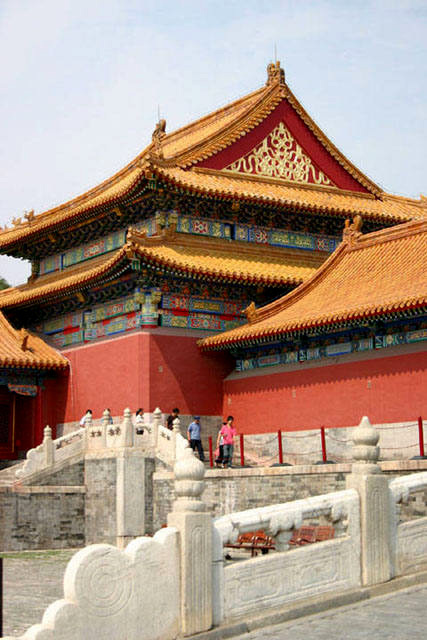 The East Qing Tomb (royal tomb of famous Express Dowager Cixi of Qing Dynasty) ) is about 40 minutes driving from Huangyaguan, and most travelers will visit the tomb on the way. There are two underground palaces with similar style. Yuling for Emperor Qianlong is recommended for its featured rock carvings in the tomb. Good Luck for your Great Wall Marathon!